Uber wins when you hit the “Request A Ride” button, so shouldn’t it try to put that button everywhere? It seemed like a smart plan, so I did some digging and now sources confirm to me that Uber plans to launch an API soon. Google Maps was just the start. While it’s not clear what the exact functionality will be, the Uber API could potentially let partnered developers add the request button to their apps. It might even support creation of full-fledged Uber clients. Soon the methods to call Uber for a ride could become as ubiquitous as its cars themselves. Today, Uber has no public API. It’s got an option to set up corporate expense billing with Concur. And Re/code says Uber talked with Facebook about an integration into Messenger. The extent of its openness is appearing as a pedestrian and public transportation option inside Google Maps to people who’ve already downloaded Uber. The “Get An Uber” button shows the travel time and distance, and a single tap fast-switches you to Uber with your destination pre-loaded. This is smart of Uber, and a win-win since Google Ventures is a huge stakeholder in the transportation startup. It subtly reminds people that walking and public transit are slower and more arduous than a private driver. Uber is an impulse purchase. A quick tap can cost you $20. Uber just needs you to surrender to luxury and tap the button. Hence, the more buttons, the more taps, the more money it makes and the stronger its coverage gets. That’s why an Uber API makes so much sense. When I asked about the API, Uber declined to comment. However, mutliple sources close to Travis Kalanick’s company say a new way for third-party apps to integrate Uber is coming in the next month, though they didn’t have more details on exactly how it will work. 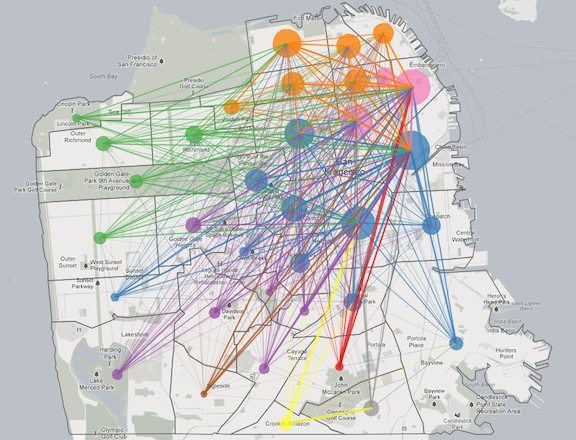 Here’s how Uber could potentially cooperate with developers. I’d imagine that at first it would likely only be open to a family of well-vetted partners, providing more of a semi-private API for a controlled platform than an openly available public API. Uber might just offer a “Get an Uber” button like in Google Maps, or let apps show how many minutes away the nearest driver is and if surge pricing is on. Maybe Yelp, Foursquare, or OpenTable could let you book a one-tap ride to a restaurant. Travel apps like HotelTonight could offer an instant Uber to your bed. Navigation apps like Waze, Bing Maps, and Yahoo Maps could get integrations just like Google Maps. Even social apps like Facebook Messenger or WhatsApp could let you hail a ride to an address you’re discussing. If the partnerships go well, Uber could potentially open up the API to more publicly to developers. They might be able to build whole skins on top of Uber that are designed for specific purposes. There could be a cutesy version for kids that only lets them book rides home, or one for teenagers where a parent has to approve the fare quotes before a ride begins. A power user’s “uberUber” could offer faster fare quotes, let you draw the route you want to take, or let you set up rules like “alert me each weekday when there’s no surge pricing between 6pm and 7pm” to consistently get you the cheapest ride home from work. I’d bet the Uber API will come with strict rules about how the Uber brand can be portrayed and what functionality is available. The company doesn’t want to lose its veneer of sophistication thanks to some piss-poor hacks. Uber once blocked an app called Corral that let you compare different transportation options like Uber, Lyft, Sidecar, walking, and public transit. I wouldn’t be surprised if Uber didn’t allow this. As the market leader, it could demand exclusivity from partners. It doesn’t want you choosing between it and competitors, but instead between its different UberX, taxi black car, UberXL, and SUV price points. As for revenue sharing, Uber might be able to convince partners and developers that an Uber button makes their app better. Alternatively, it might dispense a cut like a $1 referral fee per ride initiated. Even if it has to dole out a revenue share, colonizing the mobile web with Uber buttons could pay big dividends. Facebook had great success with a similar plan to populate the Internet with Like buttons. They made sharing an impulse decision, sent the social network valuable content, and drove awareness even when they weren’t clicked. Uber’s buttons could help it sprint ahead of competitors like Lyft, and cement its name as the defacto on-demand car service the way “Google” became the word for web search. Uber has spent the last 5 years working to get as many cars on the road in as many cities as possible. The goal is to minimize the time between you wanting transportation and stepping into an Uber.